Today I had the luxury of going to my friend Camilla’s house to “play art”. She has a real studio (not a converted parlor). And you should see her toys! 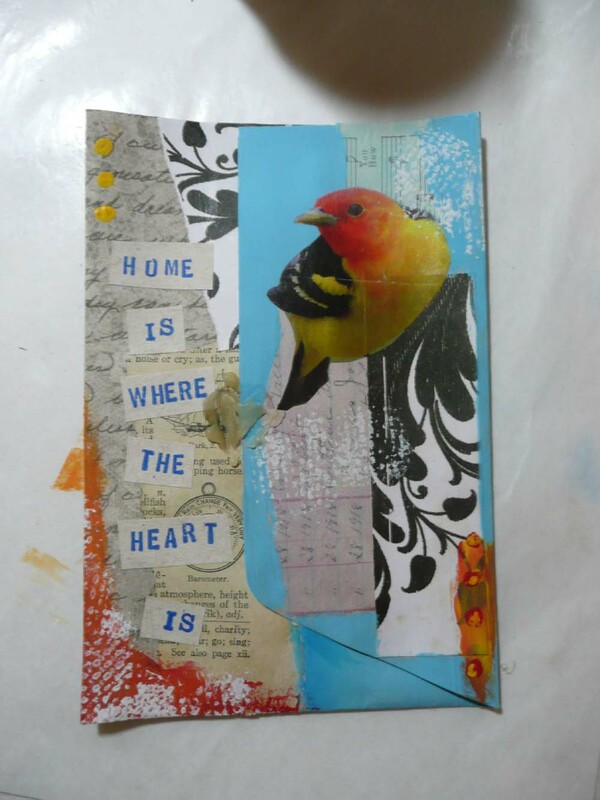 She’s got paints, stamps, stencils, papers and tools galore. We each “did our own thing” and kept each other company. We did actually take a break and have a delicious salad and scones for lunch, but then it was back to “play”. 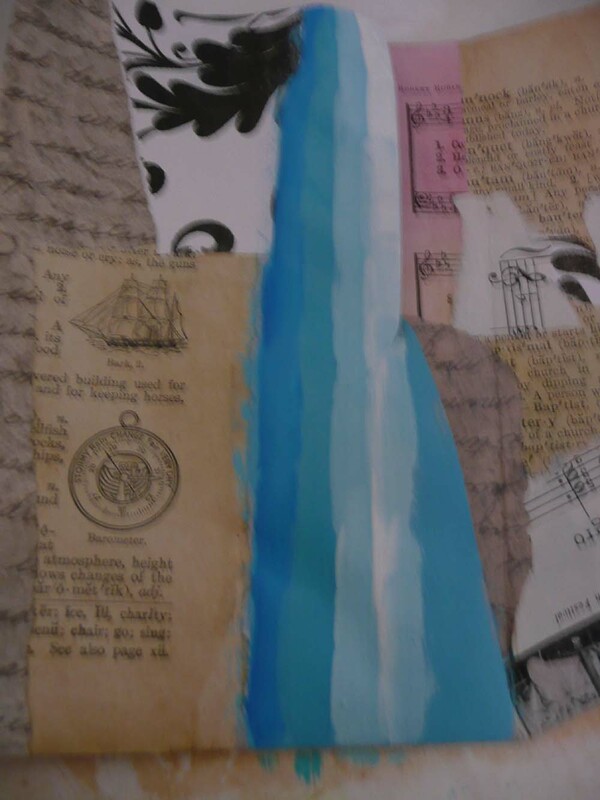 She worked on some pages of her art journal and they turned out fabulously. 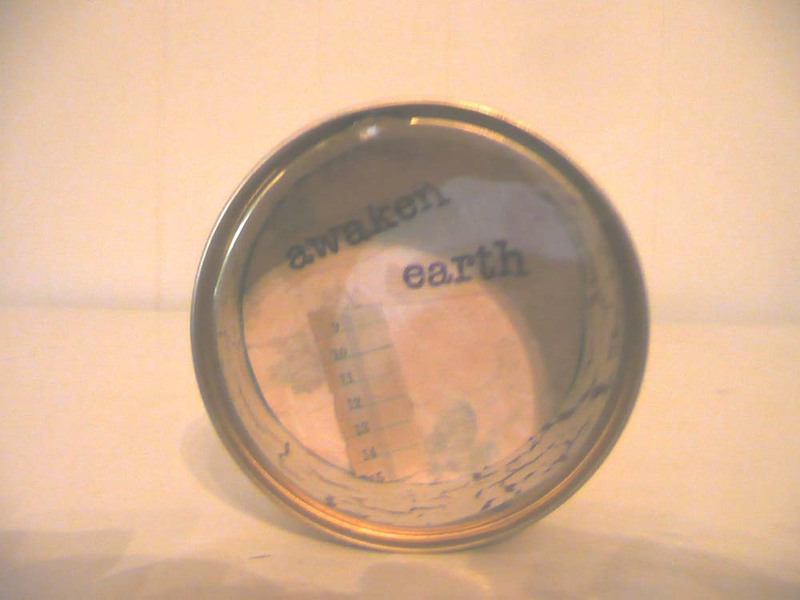 I worked on two of the tiny 3″ x 3″ canvases that I bought on my birthday. 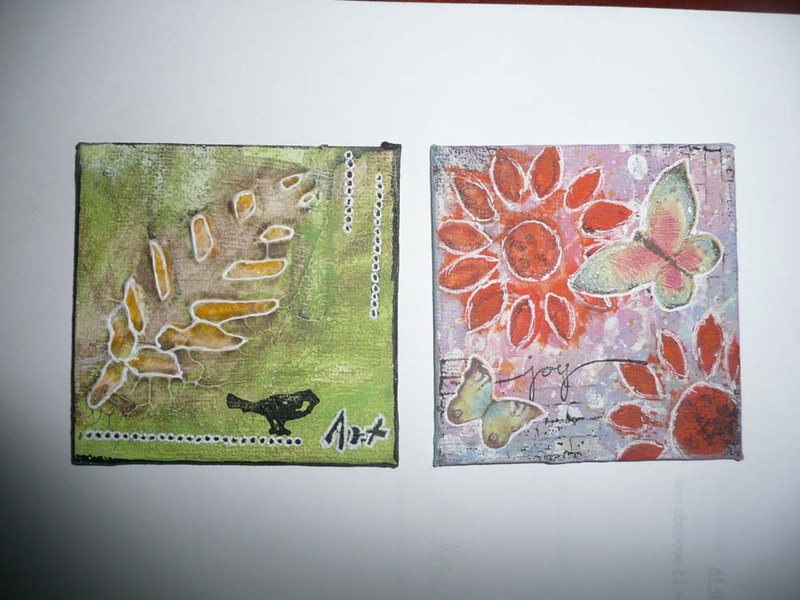 After many layers of gesso, paints, stamps, pens and graphics here are my finished pieces. Unfortunately the flash makes them look a little washed out, but I am really happy with this tiny art! What more can I say? Here is a journal page I created last night. Enjoy!!! 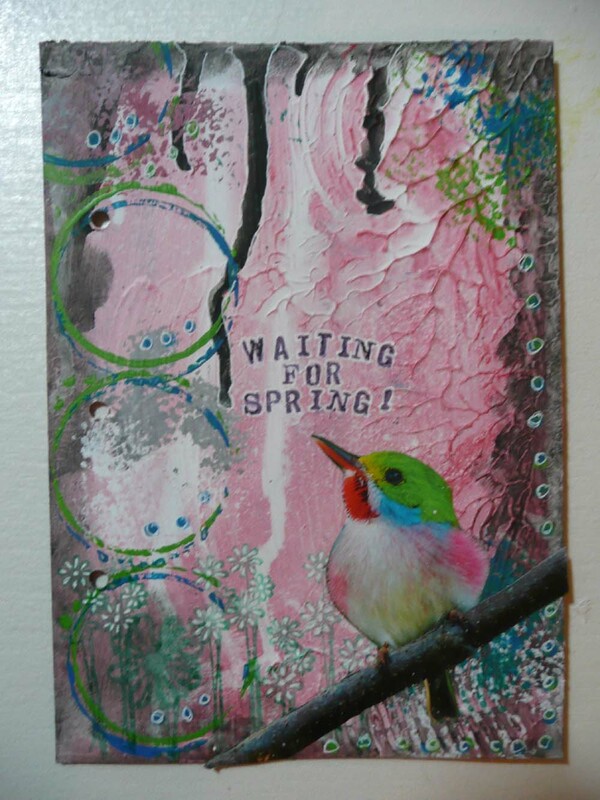 This is the last art journal page I am going to post for a while. Do I hear cheering? No, really, I have enjoyed making the last 5 journal pages and will continue to make more as I am really enjoying this process. But I do know when enough is enough for my loyal readers. Plus, I have some other tutorials and fun ideas I’m waiting to try! So here are the six prompts for today from http://www.daisyyellowart.com. When I first looked at this list I was thinking it was going to have to be a sickly sweet page. But after thinking about what to do, and re-thinking about what to do, this is what I came up with. 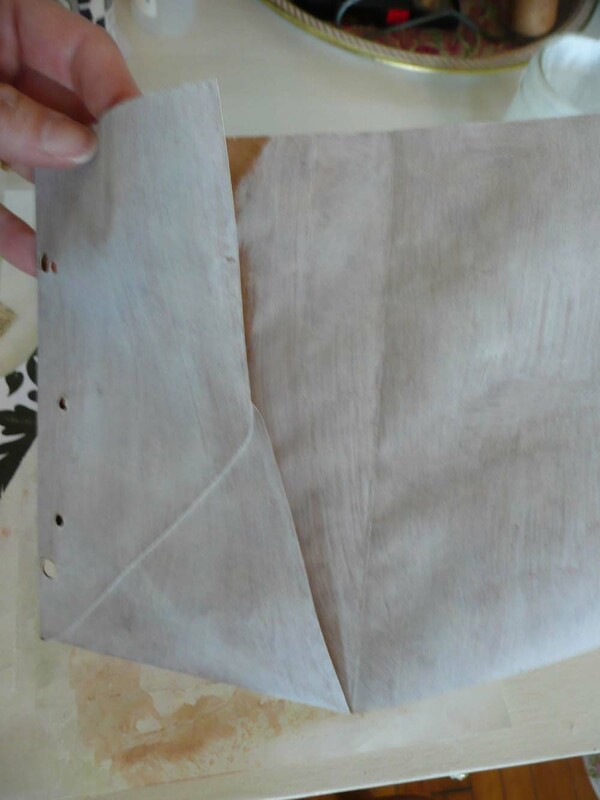 First I put a thin layer of gesso an old binder pocket I cut in half. I was thinking of cutting a window in the pocket but then I thought that would be overkill! Next I painted on the sky blue in patches. 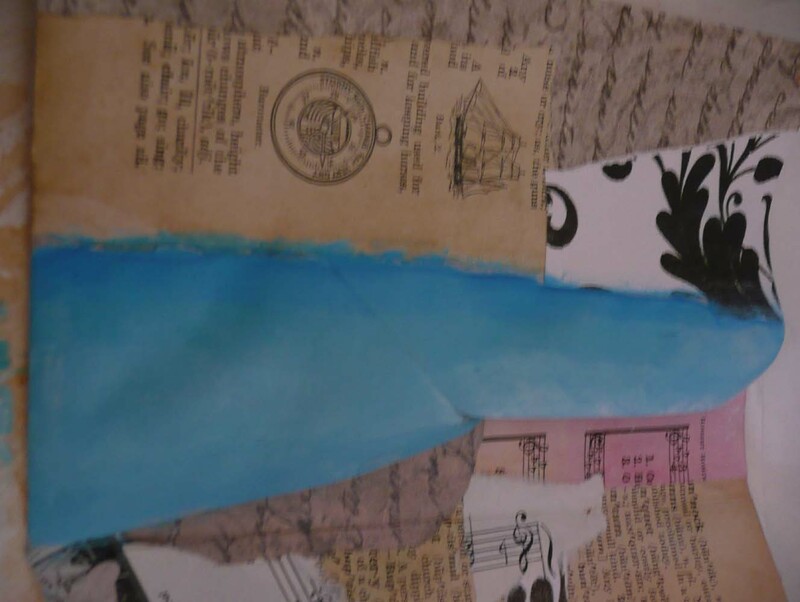 Along the inside edge, I painted a blue rainbow by lightening the shade each time. ( I love real rainbows, but it would be hard for me to put one on a journal page without “my little pony” or the care bears too.) I blended the blues well so the rainbow effect is subtle. Then I added the image of a Western Nuthatch, some text (which includes the word heart) and some paint. This is where it gets interesting. I decided to put elements from a real birds home into the pocket and seal it up. People who haven’t see this blog will be curious as to what is inside the pocket. This is what the little bird has in her house. 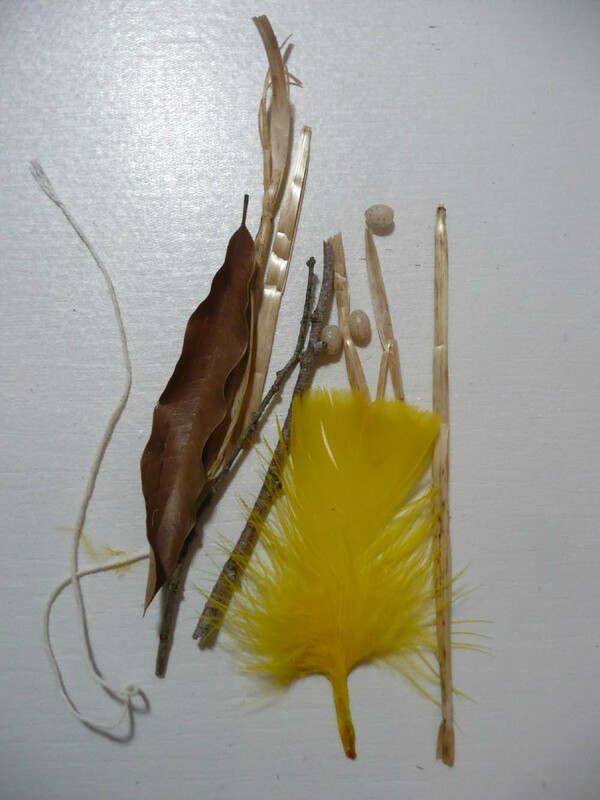 Some string, straw, a leaf, a feather, a stick and some tiny eggs. Into the pocket they go. Now that the pocket is complete, I sealed it shut with wax and a heart shaped stamp. I hope you have enjoyed laughing at looking at my journal pages. In just five days I’ve really learned a lot. 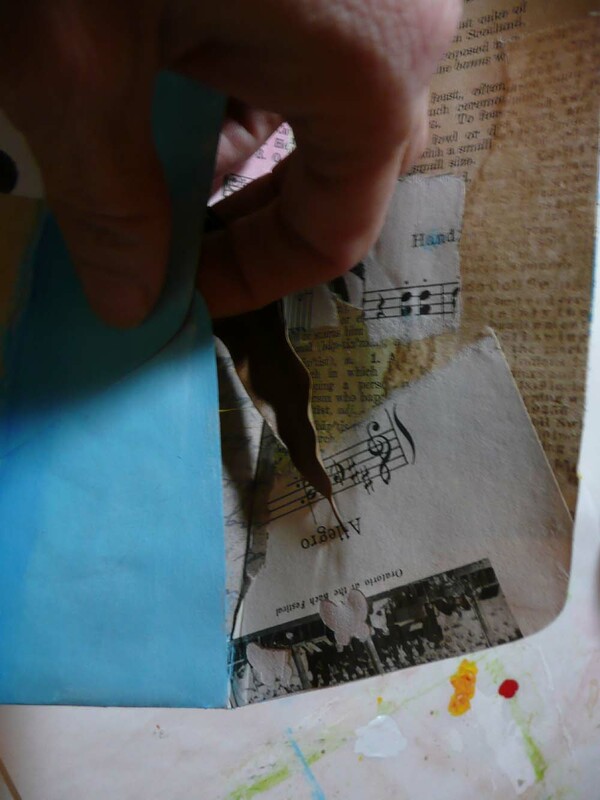 I strongly suggest that you go Daisy Yellow Arts website for tons of information on art journaling, as well as oodles of prompts should you need them. Thank you again for your patience with this project and thank you to all the kind feedback. Next week I’ll be back with something totally different! Every once in a while I mention her in my blog posts. 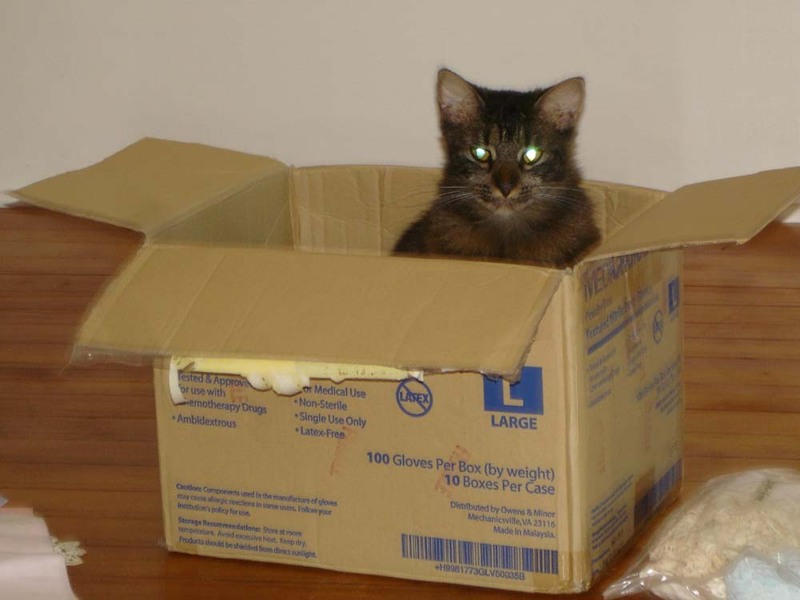 What I have never mentioned before is her preferred dining choice, which is this. Miss Golightly only eats 1/3 of a can of wet food a day, but we still seem to put a lot of her cans in the recycling bin. So of course I’m thinking, “What can I do with these empty cans? This is the first idea I came up with. After washing the can out really well (ewwww!) I lined the inside and out with interesting papers. As you can see from this picture the papers don’t match, which was intentional and not just an error because I wasn’t wearing my glasses. 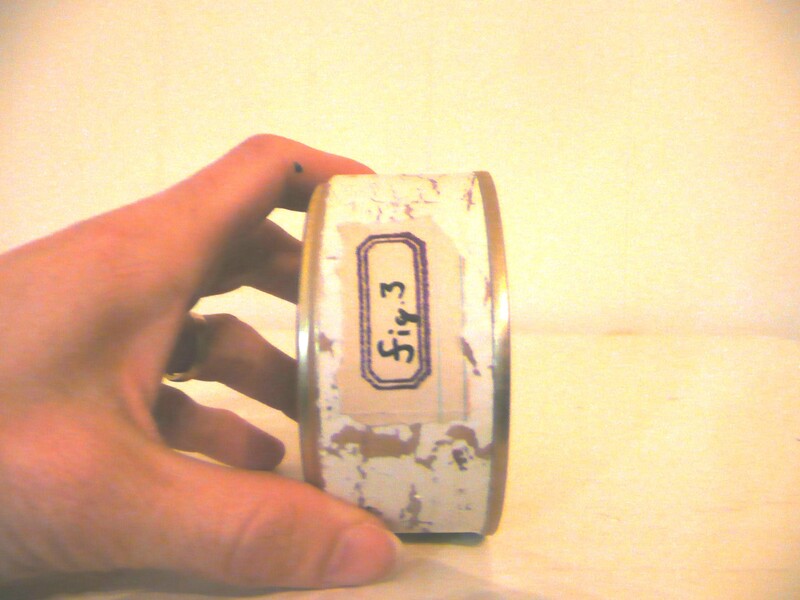 Then I stamped some text on old ledger paper and glued it to the bottom of the can with an additional piece of ledger paper “just because”. Please excuse the darkness of these pictures. I seems my photographer, poor dear, is still being challenged by her new camera. Maybe one day she’ll catch up to 21st century technology, however, I don’t have my fingers crossed. Graphics were also randomly added to the outside of the can. I made this one look like a tag from a nature journal, at least that was my intention. 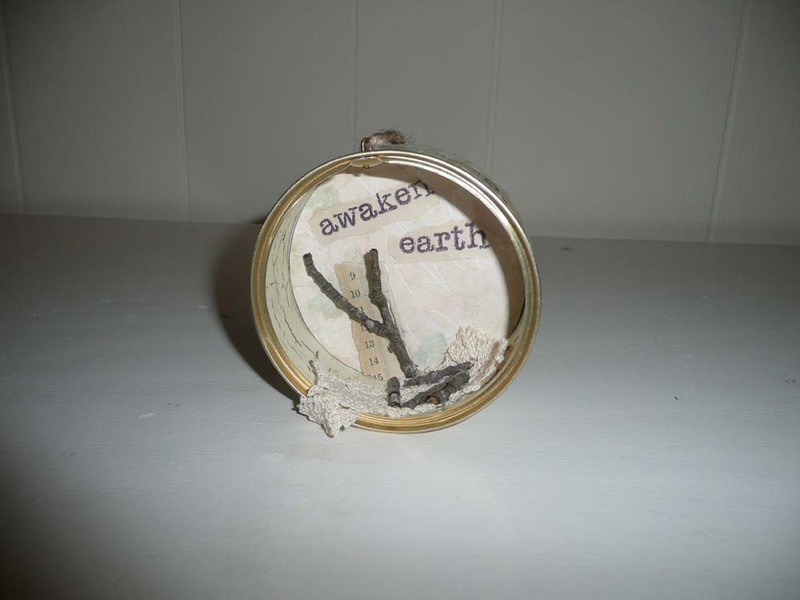 A piece of twine and a button were inserted through a hole I punched in the edge of the can to make a hanging loop. Some sticks left over from my post “Cardboard, Twine, Stick” were glued to the back and some lace and sticks were glued to the bottom edge. You can see what’s coming next, can’t you? 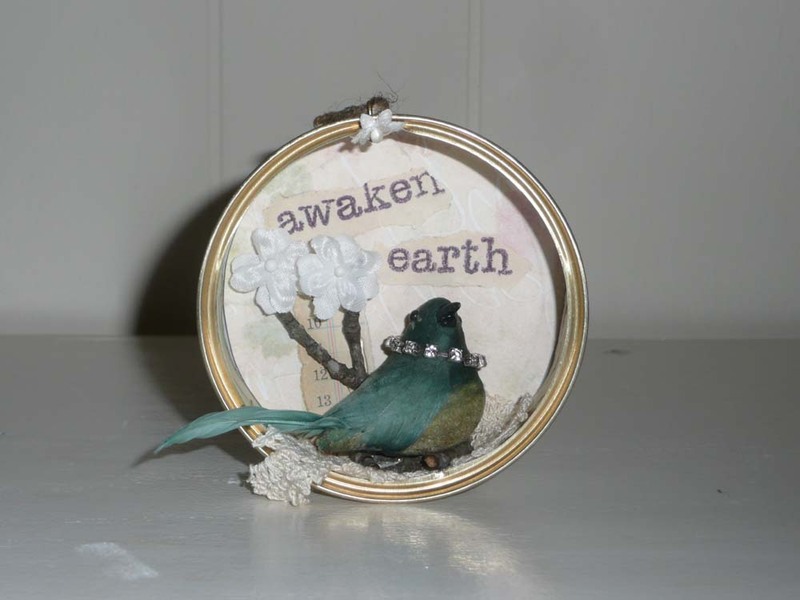 A fancy little bird wearing a rhinestone necklace and some flowers to complete the Can “Do”. Now, I understand that not everyone is going to like this particular look, but the possibilities are endless for decorating your cans. 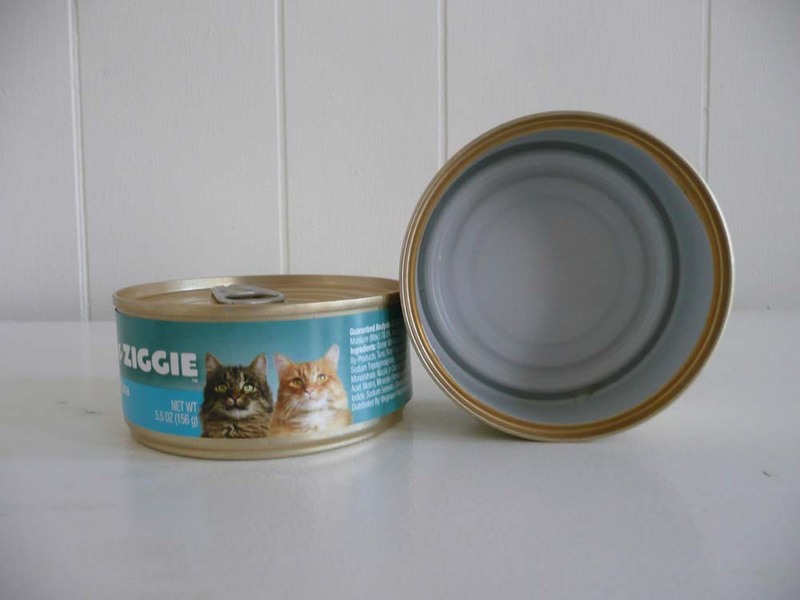 So the next time you are about to throw away or recycle a cat food or tuna can (isn’t it the same stuff?) 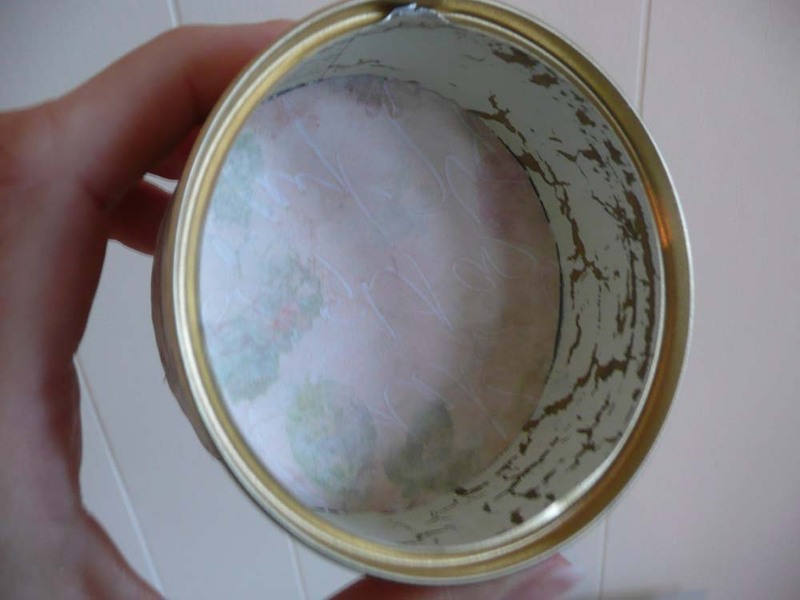 dust the cobwebs out and think of a way to create your own can “do”!!! A little post script – next week I will reveal the studio/office makeover!! !